Simple, insightful, and effective digital solutions advance our quality of life. The services and products Utegration provides make utility operations more manageable for you and your customers. From customer service to operations, we offer services that optimize the digital utilities experience. If you didn't see us at the conference, you will be able to download our presentations below. Confused about S/4HANA and How to Get There? You are not alone. In a recent survey of Utilities in North America, Utegration found a significant variance amongst Utilities regarding basic requirements such as a plan and a business case to support the required migration to S/4HANA. Want to talk about: Transformation Navigator, S/4 HANA Readiness Assessment, technical prerequisites, On Premise versus Cloud Edition? Attend this session to better understand what your peer group is doing and learn about the Utegration S/4HANA Assessment Offering. With SAP S/4HANA, imagination is the limit. Can you imagine real Real-time FERC Reports based on the same Unified Journal Entry with accounting ledger? Great transparency can be achieved with the real-time regulatory view to financial data; much less effort and time are needed in the month end close process in order to duplicate and reconcile data. Can you imagine tracing the cost flow from receiving cost centers or assets all the way back to the original cost centers, workers, materials, invoice numbers, vendors, work orders, or WBS Elements? The regulatory department will gain great efficacy in answering Rate Case RFIs with all the details and origination of cost flows. Can you imagine largely simplified financial and regulatory planning processes? Planning, Performance Management, and Rate Case Design and Filing processes will become very effective with better matching between plan and actual, and easier simulation between financial and regulatory decision making. Join Utegration to learn how to truly leverage the power of SAP S/4HANA to transform your financial and regulatory processes. Utegration combines our extensive asset-intensive industry experience, understanding of master data best practices, and knowledge of the SAP solution to deliver an approach to master data governance (MDG) that goes beyond software capabilities. Ensure quality data and consistency across your organization by consolidating and centrally governing your master data. Learn how Utegration’s expertise and understanding of SAP’s Master Data Governance simplifies management and reduces cost of ownership. How can Utilities best leverage Hybris in their digital strategy? SAP Hybris has created a path through digital transformation, ultimately developing an omni-channel experience, with your customer at the center of the universe. Join us to discuss the five main areas where Hybris will allow you to cut costs, time, and complexity– commerce, marketing, revenue, sales, and service. What is the value of a 2 Tier AMI Solution? The traditional AMI deployment, has been widely accepted in the past, but creates many operational and efficiency gaps: incorrect/delayed billing, poor customer experience, infrastructure, knowledge transfer and change management costs. Introducing operational simplicity. A new breed of 2 tier integration Meter Data Management (MDM) solutions providing simplified SAP AMI roll out and support for deeper analytic insights into metering and customer data. An AMI implementation brings about disruptive changes to the utility company and its stakeholders. 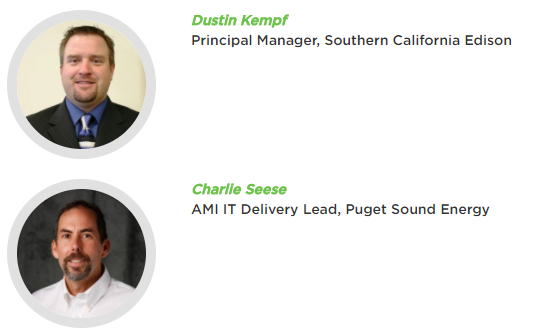 Three utility companies that have implemented AMI— Southern California Edison, Puget Sound Energy & Sacramento Municipal Utility District—share their experiences to help smooth out the journey for others that follow. Chris Bui, Utegration's Director of CRB & AMI, will be moderating the panel discussion. Rick Charles from First Energy Products (FEP) will share his experience in selecting, implementing and running the SAP Hybris suite including yCommerce, yMarketing, yBilling, and C4C. FEP is a non-regulatory retail arm of FirstEnergy.